PITTSBURGH (AP) — Sean Spence’s word choice was not by accident. Spending three years in the Pittsburgh Steelers locker room has taught the linebacker certain opponents evoke certain feelings. There’s only really one that pops up when the Baltimore Ravens come to mind. “Just a rich tradition of hatred we have for one another,” Spence said. Even if Spence’s participation in that tradition is limited. He’s hardly alone. The vast majority of players on both sides of the field will be getting their first taste of what one of the NFL’s true blood feuds looks like in the playoffs when the Steelers (11-5) host the Ravens (10-6) in the wild-card round. That list, however, will not include Le’Veon Bell. 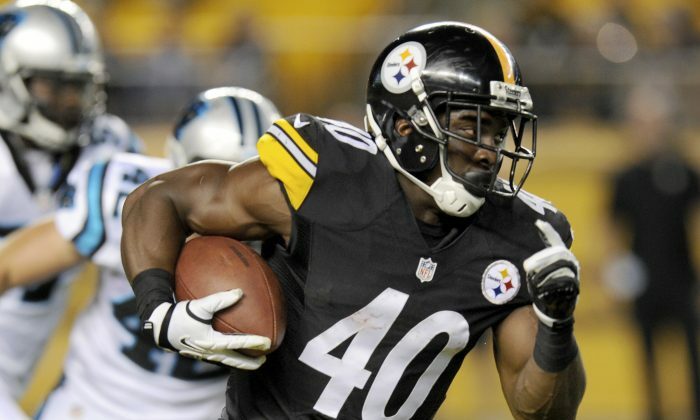 Pittsburgh’s All-Pro running back and team MVP is out with a hyperextended right knee, leaving rookies Josh Harris and Dri Archer and newly acquired Ben Tate in his place. Tate, on his fourth team in 12 months, was looking for a job a week ago. Now he finds himself thrust into one of the league’s longest-running dramas. And really, that’s kind of the point. Signing with Pittsburgh or Baltimore comes with the underlying expectation that for any season to be successful, you’re going to have to find a way to deal with your archrival. The Ravens and Steelers have been battling for AFC North supremacy off and on for most of the millennium. Both have two Super Bowl titles since 2000. Three times they’ve met in the playoffs at Heinz Field. Three times Pittsburgh advanced while Baltimore trudged back to the locker room wondering how its season slipped away. The Ravens led by 14 at the half in the divisional round in 2010 only to watch the Steelers rally, winning on a Rashard Mendenhall touchdown run with 1:39 to play. It’s a painful history in Baltimore, though the Ravens hardly sound worried about repeating it. The Ravens only have 19 guys remaining from the group that won the franchise’s second championship two years ago. They split their two regular-season meetings this year, with each club winning by 20 points at home in a couple of rare blowouts in a series where the result usually isn’t determined until the final seconds. Both sides are preparing to etch another bruising chapter on Saturday. It’s January. It’s Ravens-Steelers. That’s the way it’s supposed to be, right? Some things to look for with a spot in the final eight on the line. SACK TANDEM: Dumervil finished the regular season with a career-high-tying 17 sacks and Suggs had 12 in a friendly competition that often spelled doom for opposing quarterbacks. No duo in the NFL had more in 2014. TROY’S RETURN: Few players have had more of an impact on the rivalry than Steelers safety Troy Polamalu, whose 40-yard interception return for a touchdown sealed Pittsburgh’s victory in the AFC Championship game six years ago. Polamalu is expected to play after sitting out the finale with a sprained knee. KUBIAK FOCUSED: Ravens offensive coordinator Gary Kubiak has been mentioned as a possible choice to fill several head coaching vacancies, but the former Houston Texans coach had no desire to talk about where he might be next year. Under Kubiak’s direction, the Ravens set a single-season team record with 409 points. BROWN’S BREAKOUT: Steelers wide receiver Antonio Brown’s first big moment in the NFL came on a 58-yard pass in the 2010 divisional round that set up Mendenhall’s winning score. Fast forward four years and Brown is an All-Pro and one of the most hard to cover players in the league and faces a secondary ravaged by injuries. NGATA PROBLEM: Baltimore’s fourth-ranked run defense should get even better with the return of nose tackle Haloti Ngata, who missed four games while serving a suspension for violating the league’s performance-enhancing drug policy. The Ravens went 3-1 in his absence but were pushed around by the Texans in the lone defeat, an upset loss on the road that knocked Baltimore out of any contention for the division title.